Mercedes Benz is bringing new models to extend its S Class lineup. After release of S 400 Hybrid and S300 BlueTEC hybrid we have all new Mercedes-Benz S500 Plug-in Hybrid with more features and technical innovations. With this new release Mercedes has added some extra notes in its list of achievements while perceptions are that the price for this model will drag quite a lot from its customer’s pocket. However let us leave that part till company releases the price of its new model and march ahead for a closer look of this new innovation. Interior of Mercedes Benz S500 Plug in Hybrid is a true example of company’s off-the-shore progressive thinking and this definitely invite good competition in the automotive market. Starting the interior details with the digital dashboard which houses almost everything you need to control and use your car for. Right in front of it are diamond-quilted seats with ventilation. Now we are about to introduce you to the most appreciable feature in the interior of Mercedes Benz S500 Plug in Hybrid 2015, credit to which goes to fully electric HVAC system. We are talking about the Pre-Entry Climate Control system, which enables you to set the car for your next schedule and following it model on its own will start to cool itself by using its electric power, as an add-on to provide comfort on cool days steering wheel and armrest will preheat themselves. Few additional standard features include, panoramic roof, LED Ambient lighting and two 12.3 inch high resolution screens for center display and instrument cluster. Rounding up everything interior is spacious and can house the tallest and healthiest person you know with ease and is loaded with some very innovative features that will provide you best-in-comfort in its luxurious arena. Unlike its interior, exterior of Mercedes Benz S500 Plug in Hybrid 2015 comes as a standard work. The only major difference that we noticed in the entire exterior is a mounted charging port housed on rear bumper’s right side. Port is connected to a locking mechanism to prevent it from theft and damage. With a little stretched body it gets a large grille and intimidating headlights. Few more standard exterior features include anticipatory energy management, Magic Vision Control, Collision Prevention Assist and Soft close doors. In all exterior of Mercedes Benz S500 Plug in Hybrid 2015 is a standard luxurious vehicle with some additional features for use, you can expect from luxury brand like Mercedes. 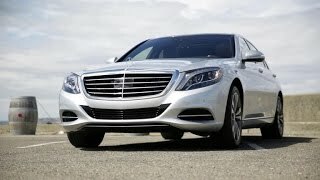 Now here is something that will interest you most, Mercedes Benz S500 Plug in Hybrid 2015 gets its power through a 3.0 Liter Sporting V6 engine that produces total output of 329 hp and peak torque of 480 nm. Adding to it is additional power coming through a 114 hp electric motor delivering 340 nm of peak torque. Thus the total system output round off to a whooping 436 hp and peak torque of 650 nm. With these figures rolling Mercedes Benz S500 Plug in Hybrid, it can reach a top speed of 130 mph while 0-62 mph sprint finishes in 5.2 seconds.